Enjoy the beauty and drama of art glass on the outside of your home. 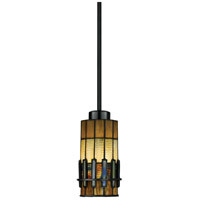 This design was inspired by the Arts and Crafts movement, and features a handcrafted, genuine art glass shade with an attractive, three-dimensional geometric pattern in rich earthtones. Fluorescent fixtures in this collection lower your energy consumption by using flourescent bulbs, and by having a photocell that automatically turns the light off during daylight hours. The fluorescent fixtures meet Title 24 requirements.